Ovah Coffee: Tomorrow's A Steelers-Pizza Night! One day. Just one more day left and it's the night we've been waiting for ~~~ Pittsburgh Steelers to go on and try beat the Green Bay Packers to win their seventh Super Bowl. Woo hoo! I've only started getting inclined to NFL a year ago. I am still learning the ropes, knowing the rules and understanding the entire concept of the game. It's such a relief that boyfriend's patient enough to guide me through. He's a big Steelers fan, you know... since I don't know when. His fave man? #43 ~~~ Polamalu! Boyfriend even has a Polamalu jersey and wears it whenever the Steelers set foot on the field. Unfortunately, since Sweden's seven hours ahead of the U.S. of A, we'll be staying so late at night just to catch Super Bowl live on telly. The game's scheduled to begin at half past midnight here which only means that to keep the tummy satisfied and the brain awake, it's definitely gonna be a pizza night for boyfriend and me! As you all know, I make pizza from scratch and my pizza sauce always comes with TABASCO® Original Red to spice up the flavour. Have checked the cupboard and bammm... we've ran out of TABASCO. Sadly, our local grocery store doesn't have it in stock either but it is comforting to know that they have at least samples to keep their clients happy. 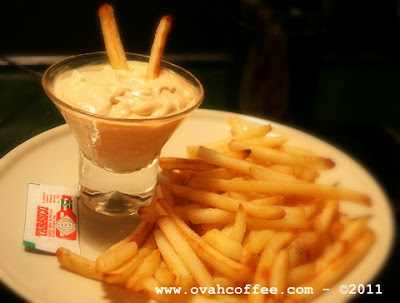 TABASCO® Original Red doesn't only result to Pizza Perfected recipes, it is also excellent in enhancing the taste of my favorite dip ~~~ the mayo-ketchup-TABASCO dip. I've actually had this yesterday for my fries. Oh so yum! Mix mayo and ketchup in a bowl. 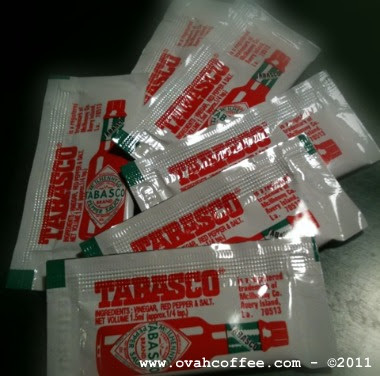 Add TABASCO little at a time until it's reached your desired kick! Sit back, relax and start dipping! Pretty easy, eh? Searching for more tastylicious recipes? Check the Game-Day Party Menu! Fingers crossed, our Steelers-pizza night will turn out awesome! Go Steelers! The Super Bowl and pizza go hand in hand for you just blogging and bugging! LOL! It is cool to see NFL fans from other countries like your BF, and that you are gonna tune in, too! It is like another holiday here in the U.S.
haha! hand in hand just like blogging and bugging, eh? Made me laugh. Pizza and Super Bowl surely is a great team. Yup. There are lots of NFL fans out here. Oh my! I can think so.... having like an NFL holiday in the USA. Cool! super bowl and pizza! that's great!! Whew ... Tabasco in pizza sauce should fire up the meal. Fun game to watch, but not to sure about the wee-morning hours. Hope all is well. Hello Frank! So true! Makes pizzas yummier!